Can you imagine walking from Bodega Bay to Healdsburg? No? How about strolling just a few miles a day on quiet country roads, stopping for private winery tours, and arriving at a five-star B&B where your luggage is already in your room! This story is primarily from an article published in the Press Democrat, the largest newspaper north of San Francisco. Sounds like a natural idea for the Sonoma Wine Country, doesn’t it? 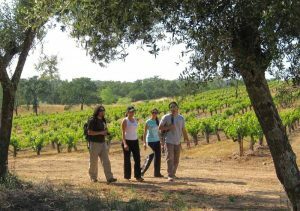 In fact, Wine Country Trekking (WCT) is the only company based in this county that offers inn-to-inn, customized, self-guided walks. They do all the heavy lifting for their guests, from providing individualized, daily itineraries and topo maps to making the arrangements for VIP winery experiences, luxury accommodations, gourmet picnics, and restaurant reservations. When needed, they’ll even set up airport transfer for your family and friends who fly into the Bay Area and Santa Rosa airports. The five-day, four-night “Bodega Bay to Healdsburg” trek starts with two beach walks on the Sonoma Coast, then meanders shady footpaths in Armstrong Redwoods State Natural Reserve and lingers overnight at the perfectly pink, Mission Revival-style Applewood Inn. 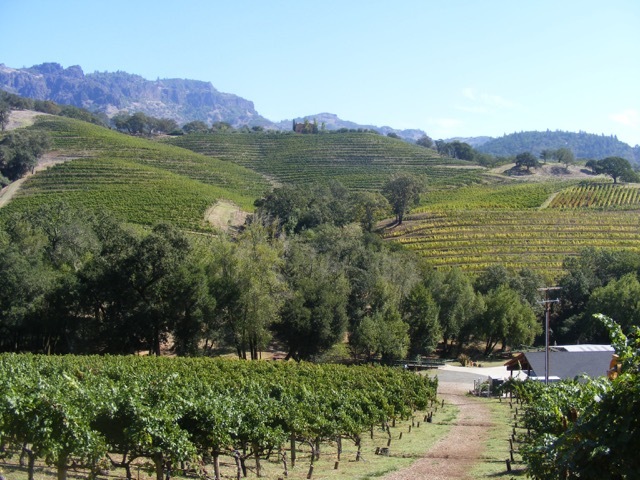 Each day involves from 3 to 9 miles a day of walking, with visits to several Dry Creek Valley appellation wineries, a picnic at a lush organic farm, and a private tasting in a romantic wine cave. The destination is Healdsburg, where lodging is luxurious at Madrona Manor, one of California’s most spectacular Victorian-era mansions, and a good example of the WCT’s taste in upscale accommodations. Beyond health benefits, self-guided walking tours are designed for those who prefer privacy and going at their own pace, plus traveling with family or friends, rather than with a group of strangers. 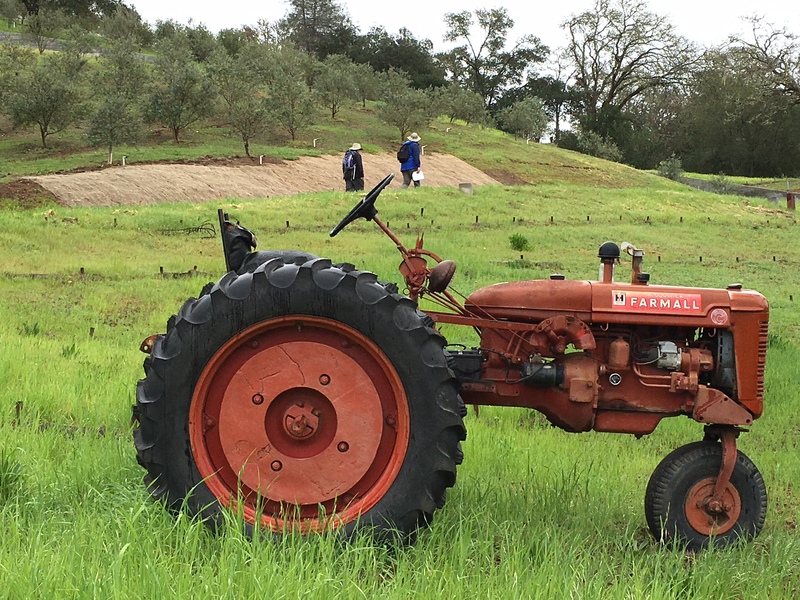 Wine Country Trekking is the brainchild of Mary and Greg Guerrazzi, whose travel clientele were asking for the kind of active, inn-to-inn tours they’d enjoyed in Europe. 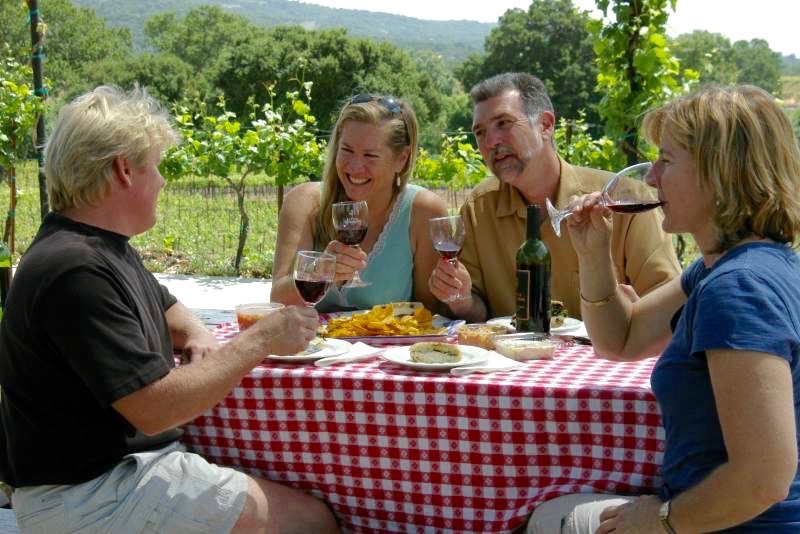 In 2007, the Guerrazzis, who are long-time residents of Glen Ellen, began designing customized trips for visitors and locals who like to get fresh air and exercise along with their food-and-wine discoveries. Strolling country roads in the Sonoma WIne Country, on a Wine Country Trekkers walking vacation. On the itinerary on this trek is a small, appointment only winery, MacLeod Family Vineyard, where rocky hillsides above Kenwood produce Sauvignon Blancs redolent of pineapple, apricot and citrus. Second-and third-generation MacLeods create an intimate experience for WCT guests by spinning family stories and sharing ripe figs off the trees during private tours and tastings. Based in Glen Ellen and Kenwood, the 5-day, 4-night “Sonoma Valley Runners Trek” is for serious runners who also want luxury and pampering. The trails are 8 to 13 miles a day, with moderate elevation gain, in Jack London State Park, Sonoma Valley Regional Park, and Sugarloaf Ridge State Park, along with VIP winery and vineyard tours, and private cave and mountaintop tastings. The “Sausalito to Point Reyes Runners Trek” rambles over rolling hills overlooking the Golden Gate, on Muir Beach, and over Mt. Tam to Point Reyes National Seashore and West Marin, and may be hiked, rather than run–or a combination of both. Rambling in the vineyards on the Bodega Bay to Healdsburg walking itinerary with Wine Country Trekking. Recent WCT guests were two college-age siblings who flew in from North Carolina, met with their parents, and embarked on a family reunion of a lifetime, the “San Francisco to the Wine Country” trek. Ten invigorating days of coastal and valley ramblings ranged from sea-breezy trails at Point Reyes National Seashore to kayaking on Tomales Bay, and winery-to-winery walks. Their trip ended at a luxurious property in Glen Ellen, named repeatedly as one of the “top 100 hotels in the world,” a Japanese-style “ryokan” complete with a zen-influenced spa. 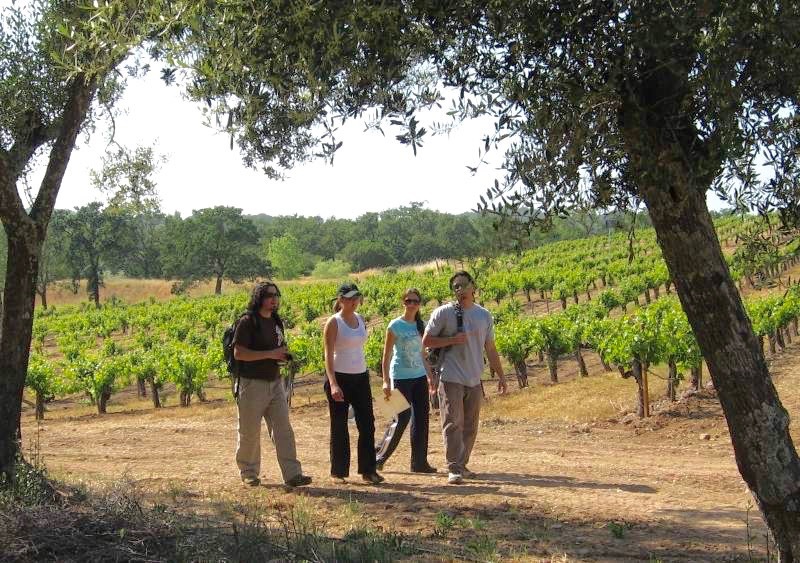 Wine Country Trekking provides customized itineraries for each couple or group, with topographical maps and detailed trail notes, both in print and electronically; breakfasts and gourmet lunches are included. Their treks are priced from $1,200 per person, double occupancy (April-November); from $1,000 December-March. Inn-to-inn walks in the vineyards and the foothills of the California Wine Country. 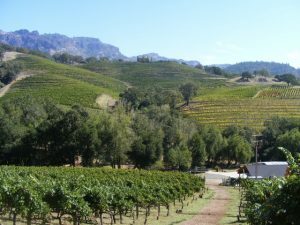 “Napa Valley and Sonoma Active Culinary Walking and Biking Tour” with Backroads, based in Berkeley for more than forty years. This tour includes advance planning, winery visits, luggage transport, luxury-level lodging, cooking class, and some meals. 5 days from $3,298 per person, double occupancy. “California: The Wine Country” with Country Walkers, a Vermont-based company offering 60 destinations in the U.S. and Europe. 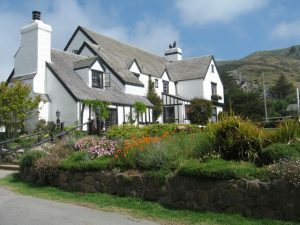 Their Wine Country walk includes detailed itineraries, wineries, luggage transport, upscale lodging, and some meals. 6 days from $2,248 per person, double occupancy. They also offer a San Francisco to Point Reyes walk.